The U.S. Public Interest Research Group (USPIRG) and the Citizens for Tax Justice (CTJ), have released a report called “Offshore Shell Games 2014,” which claims that Fortune 500 companies use more than one thousand subsidiaries in foreign countries in order to avoid U.S. corporate taxes. It also claims that the average effective tax rate of 55 corporations was under 10 percent on their foreign earned income. It then advocates to end deferral and proposes remaining one of the only countries in the world to tax corporations on their worldwide profits. Unfortunately, with such a small sample of corporations, this study paints a misleading picture of the tax burden corporations pay overseas. Its findings contradict other studies and more importantly IRS data, which reports corporations actually paid a tax rate of about 27 percent on their reported foreign income. It also doesn’t mention the fact that its proposed changes to tax law would move the United States further from international norms and would harm the economy. One of the main findings of the PIRG study is that these Fortune 500 companies allegedly paid an average effective tax rate of 6.7 percent on their foreign earned income. From this PIRG implies that most corporations are avoiding taxes. The issue though is that they try to paint this picture of tax avoidance using only a sample of 55 companies. Many exogenous factors, chiefly business cycles, can affect any corporation’s effective tax rate for any given year. Cherry-picking 10 percent of the Fortune 500 corporations does not produce a reliable result. Additionally, PIRG forget to mention that 15 of the 55 of the companies that they have data on reported an effective tax rate of over 20 percent and five of those companies had effective tax rates over 30 percent. The PIRG report has such a broad definition of a “tax haven,” that they include countries such as the Netherlands, Singapore, Hong Kong, Switzerland, and Ireland. These countries all have internationally recognized normal tax systems. What they do have in common, though, are lower corporate income tax rates than the United States. If that is what makes a country a tax haven, almost every country on the planet is a tax haven compared to the United States. The PIRG report cites a recent Citizens for Tax Justice report that claimed that more than half of all foreign corporate income was reported in 12 low-tax jurisdictions such as Bermuda and the Cayman Islands and paid an effective tax rate of 7 percent using data. Whether CTJ or USPIRG knows it or not, data from that source substantially double-counts foreign after-tax income that is transferred from one subsidiary to another. As a result, income is inflated relative to taxes paid, driving down the effective tax rate. Their analysis is akin to counting every transfer you make from your checking account to your saving account as taxable income. The biggest issue is that PIRG's findings go against what other, more rigorous studies have found and what IRS data shows. The effective tax rate they find on their tiny sample of companies is far lower than other studies on the same issue. For instance, the GAO, using BEA data estimated effective tax rates between 16 and 28 percent when they adjusted for double-counted foreign income. A study using a sample of over 9000 corporations found that U.S. multinationals paid an effective tax rate of 28 percent on their worldwide income, one of the highest effective tax rates in the world. 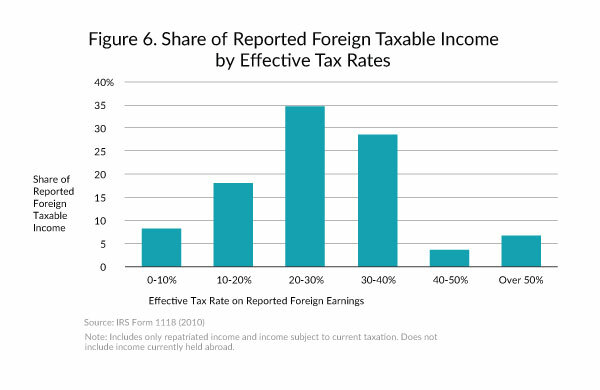 Even more, their study contradicts IRS data—data collected on what corporations actually paid on the foreign income they repatriate. According to our overview of IRS data, U.S. multinationals paid $128 billion in foreign income taxes on $470 billion in reported taxable income in 2010. This is an effective tax rate of 27.2 percent. Over two decades, the effective tax rate was 26.4 percent. The PIRG report paints a picture that a substantial amount of corporate foreign income is booked in overseas tax havens. This is misleading. According to IRS data, over 60 percent of foreign corporate income is reported in Europe and Asia, where this income faces effective tax rates of 31 percent and 26 percent, respectively. 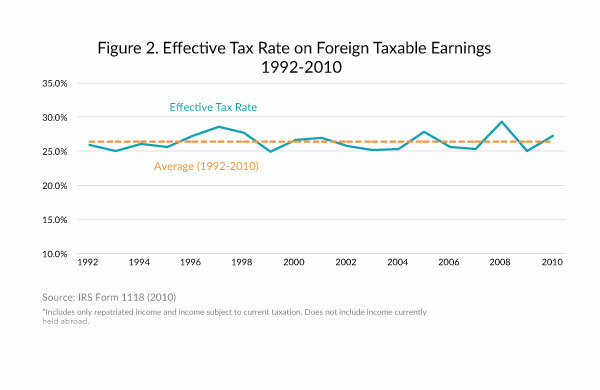 Even more, IRS data shows that more than 75 percent of foreign earned income faced effective tax rates over 20 percent in 2010. USPIRG proposes several changes to U.S. corporate law. The biggest change would be to end what is called deferral. 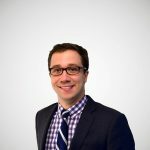 This allows corporations to defer the U.S. tax liability on their foreign earnings, which have been taxed already by the foreign country in which they earned those profits, until they bring the profits back home. They also advocate against moving to a territorial tax system that only subjects U.S. citizens and corporations to U.S. taxes on their income earned within its borders. What they do not mention is that remaining a country that taxes corporations on a worldwide basis and ending deferral moves us in the opposite direction of other major countries' tax policy. From 2000 to today, the number of countries that taxed corporations on a world-wide basis has shrunk from 17 to 6. Remaining a country that taxes corporations on a world-wide basis makes the U.S. an international outlier. Ending deferral would make it worse. USPIRG also doesn’t mention that their ideal corporate tax code has been tried in other countries with negative results. New Zealand attempted ending deferral as USPIRG suggested. The results were devastating to their economy. There’s no doubt that U.S. corporations use a variety of legal methods to reduce their corporate tax bill on their overseas operations. But this study is not an accurate portrayal of what multinationals pay overseas. If we are going to reform our tax code, it is best to be informed by the best information available. This study doesn’t cut it. 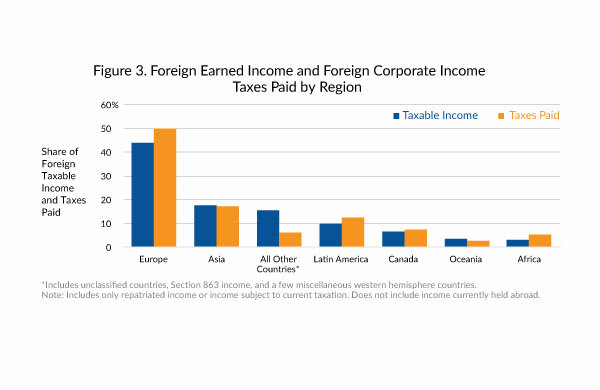 More on how much corporations pay in foreign income taxes: here.